Pioneers in the industry, we offer Submersible Pumpset, Agriculture Submersible Pump and Horizontal Openwell Submersible Pumps from India. Backed by huge industry experience and market understanding, we are involved in manufacturing a wide variety of Submersible Pumpset for our valued patrons. Motor for 150 mm Borewell are available in 3.0 HP (2.2 kw) to 25 HP (18 kw) in three phase, 50 Hz. Motor for 200 mm Borewell are available in 3 HP (2.20 kw) to 30 HP (22 kw) in three phase, 50 Hz 325-415 Volts AC Supply. Total Head Range upto 250 Meters. With sincerity and hard work of our professionals, we have carved a niche for ourselves in this domain by manufacturing premium quality gamut of Agriculture Submersible Pump. Being a leader in the industry, we are engaged in manufacturing a qualitative range of Horizontal Openwell Submersible Pumps. 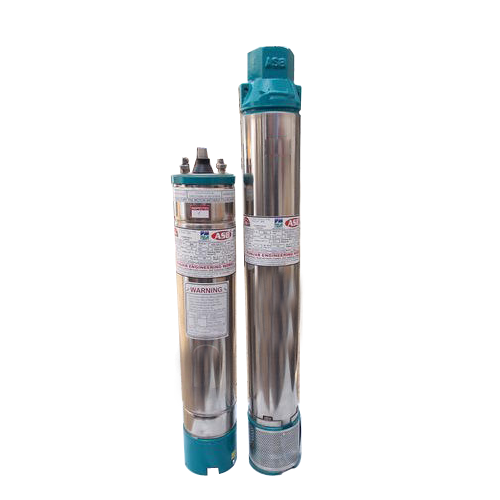 Open well Submersible Pump Set can be accessed in different specifications for appropriate usage in diverse applications. Suitable for single phase 160-240 Volts and Three Phase 340-440 Volts, 50 Hz power supplies. Heavy duty water-lubricated bearing for long trouble operation.